Singapura is the Malaysian name for the island of Singapore, from where these cats originated. Like the Abyssinian, the Singapura has a ticked coat, but which has a different, smoother feel – almost as if a piece of satin had been draped over the cat. Imported into the US in 1975, the Singapura was first shown only a year later and rapidly gained acceptance by most associations. It is still a fairly unusual breed in the US, and is rare in the West. Because in its native land the Singapura appears to seek shelter and a place to nap in drains, it was once known as the “Drain Cat” – a perhaps unfortunate sobriquet suggesting a lowly feline, and one that has now been dropped. Although it is reserved and somewhat shy, the Singapura is nonetheless a social cat that loves being around people. There are no recognized varieties of the Singapura. Cats similar to the Singapura are numerous not only in Singapore, but also throughout Asia. Since its introduction into the US, however, the breed has been developed and the standard revised, with the result that it is one of the more rare pedigree cars. Small to medium in size, a muscular, moderately stocky type. The fur is very short, silky and close-lying. The color should be that of old ivory with b ands of dark bronze and warm-cream ticking, giving a refined, delicate appearance. Fairly short and slender with blunt tip to tail. The paws are small and oval, with pads that should be rosy brown in color. - Rounded, with a short nose and salmon-colored nose pad. - Nose pad is outlined. - Large, almond-shaped and slanted. Color should be hazel, green or yellow. The first Singapura to be imported into Great Britain, in 1989, gave birth while still in quarantine, where this photograph was taken. 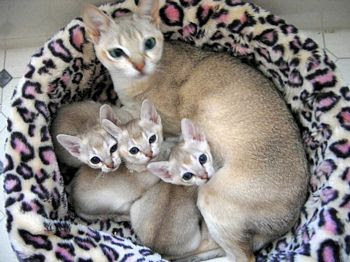 Singapura queens are renowned for being particularly maternal towards their kittens.